Neither vegans nor vegetarians eat meat. However, while vegetarians tend to consume dairy products and eggs, a vegan avoids all animal products, including eggs and dairy, and often inedible animal-based products, such as leather, wool, and silk. Vegetarianism is usually a diet, while veganism is a lifestyle. Vegetarians often choose their diet based on its reported health benefits or for religious or political reasons. In general, vegans have much stronger political beliefs regarding their diet, with some believing animals should be protected under many of the same laws that humans are. Veganism is a philosophy and compassionate lifestyle whose adherents seek to exclude the use of animals for food, clothing, or any other purpose. Vegans endeavor not to use or consume animal products of any kind. Vegetarianism is the practice of a diet that excludes meat (including game and slaughter by-products; fish, shellfish and other sea animals; and poultry). There are several variants of the diet, some of which also exclude eggs. Vegans do not consume meat, eggs, milk, honey or any food that is derived from animals. Do not eat meat or fish. Some do consume dairy and some vegetarians consume eggs. Lacto-vegetarian: eating dairy products. Ovo-vegetarian: eating eggs. Do not eat gelatin or other animal by products. Do not use any animal derived products, e.g. fur, leather, wool, etc. Do not condone the use of animal testing. While vegetarians do not eat meat, most vegetarians do not mind using other animal-derived products, e.g. fur, leather, or wool. Most vegetarians do not eat meat, fish, or poultry, but they tend to consume dairy products (especially vegetarians in India) and eggs. Many vegetarians also do not eat products that contain gelatin or other animal-based products. Lacto-vegetarians consume dairy products, but not eggs; ovo-vegetarians eat eggs, but not dairy products; and lacto-ovo-vegetarians eat eggs as well as dairy products. There is also pescetarianism, a vegetarian-like diet that avoids meat and poultry but does include fish. The vegan diet tends to be much stricter than most vegetarians' diets. Meat, fish, poultry, dairy, eggs, and all other animal-based products, like honey, are entirely avoided. Moreover, any food or other (sometimes inedible) product that makes use of animals is avoided. This often extends to clothing, medicines, and anything else in which animals or animal products are used. For example, a vegan would not use leather shoes or belts, cosmetics that have been tested on animals, down comforters, gelatin medicine capsules, woolen sweaters, or fur coats. Fruits, vegetables, grains, and nuts are staples of both the vegan and vegetarian diets. Sometimes tofu is used as a replacement for meat-based products. While some vegans may cite nutritional concerns or food allergies as the primary reason for adhering to their diet (dietary vegans), most adopt a vegan lifestyle for moral and political reasons (ethical vegans). The vegan point of view tends to be that animals are not here to be exploited by man, and that commercialization of animals involves a fundamental, inhumane component and lack of respect for basic life. There are many reasons one might be vegetarian. A prominent reason is for health concerns, as the vegetarian diet is often high in fiber while also being and low in sugar and saturated fats. Similarly, some adopt vegetarianism due to growing concerns about food safety when it comes to meat. Moral and/or political reasons are also common; for example, some have embraced vegetarianism (and veganism) for environmental reasons. Some religions, like Hinduism and Jainism, prescribe or encourage vegetarianism. Others, like some Christian sects, practice abstinence from animal products during Lent. In general, most studies show vegans and vegetarians are as healthy, if not healthier than, their meat-eating counterparts. Veganism, in particular, is very good at eliminating common food allergens, such as shellfish and dairy. A plant-based diet is high in complex carbs from whole grains and root vegetables, such as potatoes and carrots, parsnips, rutabaga, etc. There is ongoing study of the advantages and disadvantages of the vegan and vegetarian diets. Many studies have found cardiovascular benefits to both diets, and some suggest there is a lower risk of cancer among vegans and vegetarians. Vegetarians in the study experienced 12% fewer deaths over the period of the study (six years), during which 73,308 people were tracked. There appeared to be fewer deaths in the vegetarian group from diabetes and kidney failure. Caloric intake didn't seem to matter. The different participant groups generally ate around the same amount of calories daily. The vegetarian advantage appeared stronger in men than women. Cancer struck both the vegetarians and non-vegetarians in roughly equal measure. A rebuttal of the media reports of this study argues that correlation does not imply causation, and that the longer life span of vegetarians found in the study could also be attributed to the fact that the vegetarian group tended to exercise more, be married, consume less alcohol, and smoke less compared with the meat-eating group. Overall, determining whether these diets directly affect long-term health outcomes is difficult. The different types of vegetarians are rarely studied against each other, for instance, and vegans and vegetarians often tend to be more affluent or health-conscious, both of which positively affect long-term outcomes. A notable downside to the vegan diet is that vegans often need to take B12 supplements — and sometimes (depending upon how thoughtful you are to craft a well-balanced diet) other dietary supplements, such as amino acids, iron or vitamin D — as their diet tends to lack these essential nutritional components. There is also a risk that a meatless diet does not contain enough protein, which is especially concerning for growing children. There are varying results of studies on the environmental impact of diets. While no two studies arrive on the exact same conclusions, it is widely accepted that cutting down on meats and moving to a more plant-based diet would be more environmentally-friendly. A 2014 study found that moving to a meat-free lifestyle would help reduce carbon emissions. However, this does not mean that a vegan diet is necessarily the most environmentally friendly. Another study in 2016 analyzed the carrying capacity of ten diet scenarios, i.e., how much land would be required to feed 1 person under a particular dietary regime. 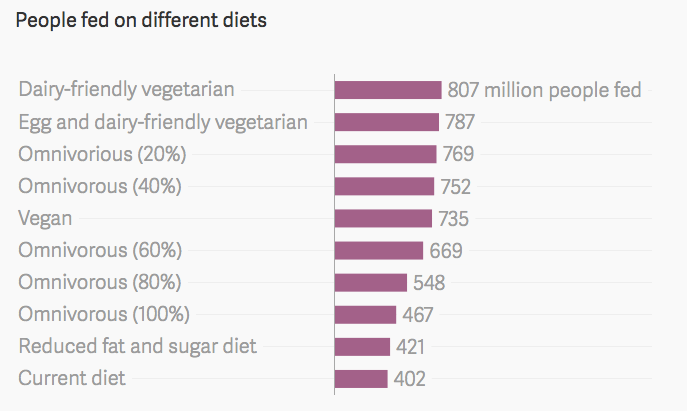 Carrying capacity for different kinds of diets, as analyzed in this study finds that a dairy-free vegetarian diet can feed the most people. Results summarized by Chase Purdy. The study found that while a vegan diet is significantly more efficient than our current diet, it's not the most efficient diet there can be. That's because not all land is suitable for agricultural use. If grazing land can be used for cattle, and a certain portion of human nutritional needs are fulfilled by dairy, then a significant number of people can be fed. A 2008 study by Vegetarian Times found that 7.3 million people, or 3.2% of the U.S. population, is vegetarian; even more are partly vegetarian, eating meat only on occasion. A majority of vegetarians are female (59% of women vs. 41% of men), and most are younger (42% are in the 18-34 demographic). A 2012 Gallup poll found the number of American vegans and vegetarians to be even higher than what Vegetarian Times found, with 5% of the population identifying as vegetarian and 2% identifying as vegan. Most vegans and vegetarians in this poll were found to be female, single, liberal, and older — in contrast to what Vegetarian Times found. In 2010, the UK's National Center for Social Research released data from a 2008 social attitudes survey. They found vegetarians and vegans were much more likely to have higher incomes. They also found non-whites were more likely to be vegetarian or vegan than whites, and often for religious reasons. Many well-known celebrities, activists and politicians, artists, and sports figures adhere to vegan or vegetarian diets. Famous vegans include singers Carrie Underwood and Erykah Badu, Olympic sprinter Carl Lewis, actor and musician Jared Leto, and civil rights activist Cesar Chavez. Among vegetarians, there is Coldplay singer Chris Martin, comedian Ellen DeGeneres, Indian independence leader Mohandas Gandhi, and actors Natalie Portman and Peter Dinklage. to the man asking if we would let our children go hungry or feed them a tasty burger, who's father was man enough to hunt and if we don't want to eat meat then fine stop forcing it upon others. You are being hypocritical, you are trying to demean others by saying your father was 'man enough'. Well, I am WOMAN enough, to find just as many nutrients and delicious foods for my child with my lifestyle. So who are YOU to judge us and what we believe. Yes, eating meats has been around since the beginning of time and is quite natural for most, but while you are typing on your laptop maybe you need to think about how many things have changed in all that time and there are plenty of other options out there for many people. You think that because you sit over there and say that we shouldn't press our beliefs, maybe you shouldn't press yours. And you are with your examples of why it's more beneficial to eat meat. So, like you said, you have your beliefs and we'll have ours. Maybe you should think next time before you think you're making a valid argument. Hey, weve evolved over millions of years and as evidenced from the assortment of teeth, some for grinding, some for tearing, its obvious we are designed to comsume both. The problen is with the food supply. It has been tainted by man's greedy nature towards greed. So they inject everything with growth hormones, antibiotics, keep the animals in very dirty enviroments full of disease, bacteria, and of course this gets in the meat and transferred to us. Anyways I eat small pprtions, I buy the more expensive steroid/growth hormone free. And eat alot of organic veggies and fruits. I stay away from cheese and milk. Almond milk is my choice, its great. Stay away from refined white sugar, aspartame, corn syrup, soda, no fried or frozen micro-wave crap, etc. I feel great at 53 and look it too. I personally dont eat meat, but I hate the instinct argument people throw out all the time. Maybe man was meant to eat meat, but what humans have done is make it a MASS production and slaughter all day every day. There is nothing normal about that. Does a lion kill a whole pack of zebra for dinner or just one, feed and then goes about his business. We are the only living things that hoard more than we possibly need. Not to mention how unsafe we have made our food by pumping it full of hormones, additive and anti biotics. Is it wrong that tyson chicken re engineered how the chicken is grown? Making it produce more white meat in half the time? I dont see how people eat food like this not to mention we are hurting these animals during. When did killing our meal become less intimate? We dont mind wasting and hurting... its sad really. wake up people!eating flesh or dead body of animals is no more safe.Run for your life now!Save it for yourself and for those who love and need you. Diana - I am on day 4 of juice fasting. Have lost 7 lbs. You asked where to go from here? I recommend the book Eat to Live by Dr. Joel Fuhrmann. It is a plant based, nutrient rich diet. His research is thorough, including the China Project where they discovered that the group in China that didn't eat meat or dairy had almost no heart disease or cancer. My husband and I are going to follow a plant based diet after our juice fast. That doesn't mean we are vegetarian or vegan necessarily. Philosophicly we aren't in that group. We just want to keep our weight down, feel good and avoid cancer and heart disease. And eventally will probably add fish or chicken once a week. Still not sure about milk though. May try almond or soy milk. There is an ever-increasing number of vegans who merely wish to eat healthier and/or counteract the effects of diabetes and cardiovascular disease. We do not worship the sanctity of animal life over human life and do not carry much of the socio-political baggage of the traditional "vegan" crowd. I enjoy wearing leather (especially my 30-yr.-old motorcycle jacket) and while I envy my meateater friends, I hold no ill will towards them. I have just read everyone's comments. It's amazing how we treat each other. No wonder countries have trouble getting along, when we can't even get along on a plain informative site. Wow! I came here to get information on how to become a vegetarian. It pains me to know animals are being tortured to feed us; as I look at my little dog and love her like she was my baby, I wonder what is the difference between her life and a cows. Then I start to think about how we can eat cow and if I would want to eat my dog. Of course the answer is no way. I have not used leather in years to prevent encouraging the sale and killing of the animals for it. I have to admit I naturally hated meat as a child, and was forced to eat it anyway, so now i love meat and am not sure how to stop eating it. But I do want to stop, so gathering information on what to replace it with in my menu, and how will it affect me physically. I also feel that ALL life, including plants, are beautiful and sacred. But I also believe that the circle of life is to eat what we need and to not waste, as the process goes on with our elimination and back into the earth. I do not condemn those who love meat because I get it. I am a person who just cannot face a plate of meat knowing it used to be breathing, living, and is just like me - meat. It pains me the thought of eating an animal - I love animals so much. There are animals that are vegetarians - they don't eat meat, and yet they are big enough to look like they do. It's awesome to know that .. Play safe here, nobody is here to do anything but get information. So why bash each other? Get along people - pls. Thank you for the information. For anyone who thinks that people are crazy for not eating meat, you might want to consider doing a little research about the "benefits" that so many of you are claiming. A simple web search for "animal protein and cancer" will reveal some shocking results. Some of you (me included) are being irresponsible with your own lives. I love to eat meat, but I just don't think the risks are worth it anymore. plants are living too.. and nature intended us to eat both plants and animals..
i would rather prefer the simple reason for eating vegetables is for health reasons (because we all know vegetables are healthier than meat and science does back this up) and not because we want to stop being cruel to animals..
still we should respect people (vegans or vegetarians) who decide not to eat animal meat or by products for their own reasoning, no matter how wrong this reasons may seem to us.. I really think that being vegetarian is only a transitional state to becoming a vegan. I just read an article on how vegan diet is more beneficial than vegetarian here http://evolvingwellness.com/posts/743/the-benefits-of-being-vegan-over-vegetarian/ - although it is still a choice to personal growth and evolution that only the individual can make. One looks at the animal kingdom and says "Look at all the animals eating each other, it is natural" I say yes, it is natural for animals to behave like animals. It is basic knowledge to know fruits and vegetables are healthy. Is it also common knowledge that meat is healthy? If the answer is not clear, then more people should be seeking light on the subject. Overall we are to attached to the pleasure from good tasting foods, instead of the food that is good. Be conscious of what you eat. Would you rather kill your food or grab it from the earth it. Been a vegetarian 39 years...reason is not because I LOve animals...its because I hate Vegetables...!! horrible little Xfgagstds!.Kill vegetables every day. The Paleolithic Diet (http://www.earth360.com/diet_paleodiet_balzer.html) is the way to go, only eat things that need no fire to prepare. Potates...no good, as they are poisonous without cooking. Grains and legumes, uh uh, as they need to have their seed coat broken through heat to actually be digested. Use foods that are grown and able to be ingested without fire. Also, spend 90 minutes watching this Youtube by Dr. Robert Lustig. It will change your life, Vegan, Vegetarian, Meat eater or whatever. Its the sugar that is getting us sick and causing diabetes, heart disease and cancer. A couple of clarifications here for earlier posters: Mr. "cows give milk for life" - A mature dairy cow will provide peak milk production for only 40 to 60 days after calving (giving birth), they are then bred and give birth again about 300 days later. So a dairy cow averages one birth per year. What happens to those calves? A few females are eventually used for dairy, but the vast majority is raised for eventual slaughter. To Mr. "an acre provides 40,000 lbs of potatoes without killing animals" - a single acre harvested mechanically kills thousands of small mammals either directly by the machinery or through the subsequent exposure to predators and elements after the vegetative cover is removed. I support anyone's right to choose vegan, vegetarian or omnivorous diet, but I cannot abide shallow and incomplete thinking. I also would like to add that when my child was an infant the doctors told me he wasn't getting enough iron because his hemoglobin was low. I was told that Iron rich foods such as livermush mixed in infant cereal would increase his iron intake. At the time I was only feeding him baby food vegetables. I added livermush to his diet and his hemoglobin count went up. There is a reason that we eat meat. It is because of the nutrition it provides. I don't eat animals because I love to kill them, I eat them because without them, I wouldn't get enough iron and protein in my diet. I respect everyone's opinion and right to eat what they choose, just don't tell me that meat will make me unhealthy when in fact the opposite is true. I have a question . I have heard of several families who actually eat nothing but raw meat and swear it is the healthiest way to live. Someone tried to cook their meat for them and they were offended ! I am a meat eater but I can't imagine eating all of it raw. So if eating meat is so unhealthy, how unhealthy is it to eat meat raw? Great article on differences between vegan and vegetarian views. Regarding the vegan lifestyle of avoiding animal products and animal flesh to eat, my question is why have a preference for fauna (animals) over flora (plants)? Vegans will not chew the flesh but will eat the plant. Why do vegans seek to preserve a living thing of the animal world but are happy to have killed and eaten a living thing of the plant world? Why? Plants are living things too, you know. I am a meat eater who believes in freedom f choice but the above conundrums puzzle me. Thanks for any enlightenment by vegans or vegetarians. What has our world come to that we as a people cannot respect the wishes of others. Whether vegan, vegetarian or meat eater your decision is between you and God above. Anything that any of us deem to be so good, can also be harmful, so whether you prefer meat or not, animal products or not, it is your decision. Just be careful of what you do, how you do it and how much of it you do. Take care of your own body, and let others worry about their own. One other things never allow anyone to push your buttons that you get so upset at what they chose to eat or not, your rant and raving cause others to think maybe, just maybe the other person is right. Now go and enjoy life and take care of yourselves to the best of your abilities. I get sicker when I see people quoting religion than eating "bad" food... That's all. I have nothing else to add on the subject Vegan vs Vegetarian. Nice article. It answered my question. *And true this is a website for getting good information so lets just use it for that purpose. Just to add a thought, not to bash a belief of ones personal life choice. If you claim to believe in the belief of god which many vegans do, then you can also agree with the human anatomy that was given to us by a superior being. Why do we have canine teeth? What's the purpose of these? To shred or help in the process of making meat smaller for consumption.. Also if vegans claim to be on th same level as living animals then why do animals depend on the aspect of predation. All these questions have not been answered. It's not a civil bashing from meat eaters towards vegans or vegetarians, it's just the simplicity of you not fully understanding what your life choice is. To each its own, I just wanted to know the difference. Meat for life! !